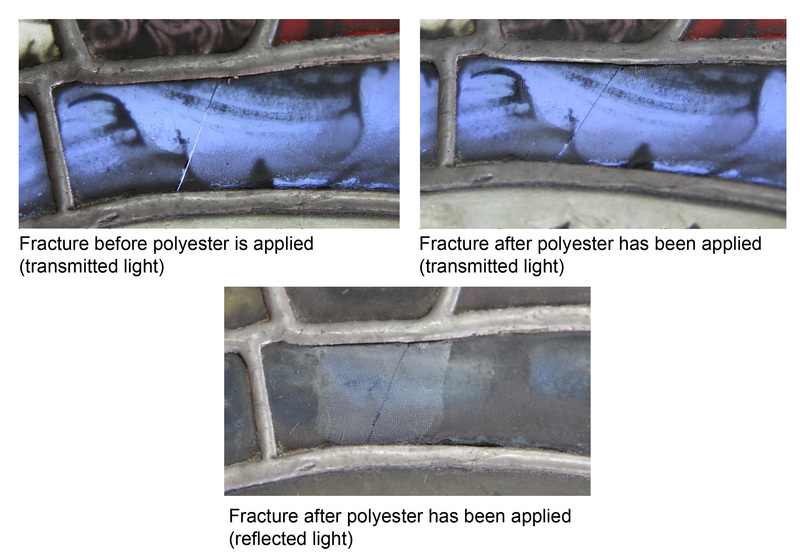 After the success with the polyester in the fabric tests we decided to see how it performed on fractures in stained glass. The images above show that white polyester contrasts against the coloured glass and is visually distracting. Textile conservators suggested this could be improved with the use of coloured polyester. Because this is only available in a limited range of colours they proposed dyeing the polyester, as they do when the colours they require are not available. 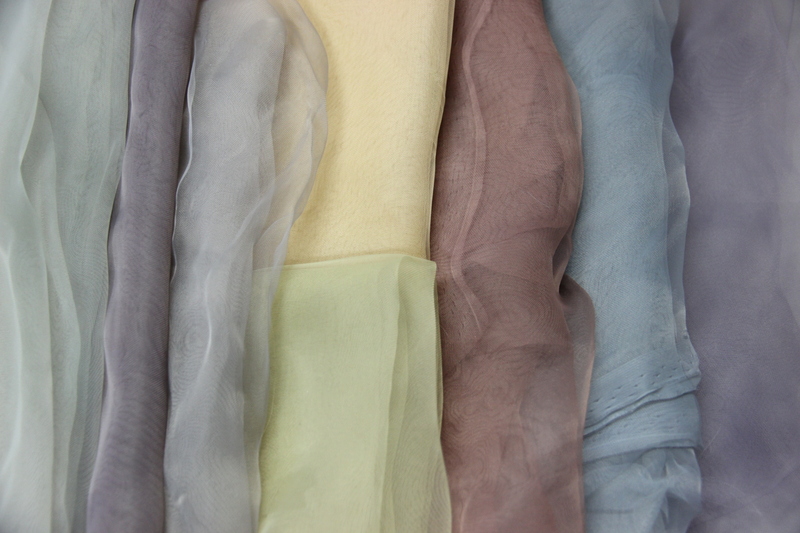 Dyes were tested to create a range of coloured polyester that complements the colours of the glass, to reduce the visual impact of the treatment as much as possible. 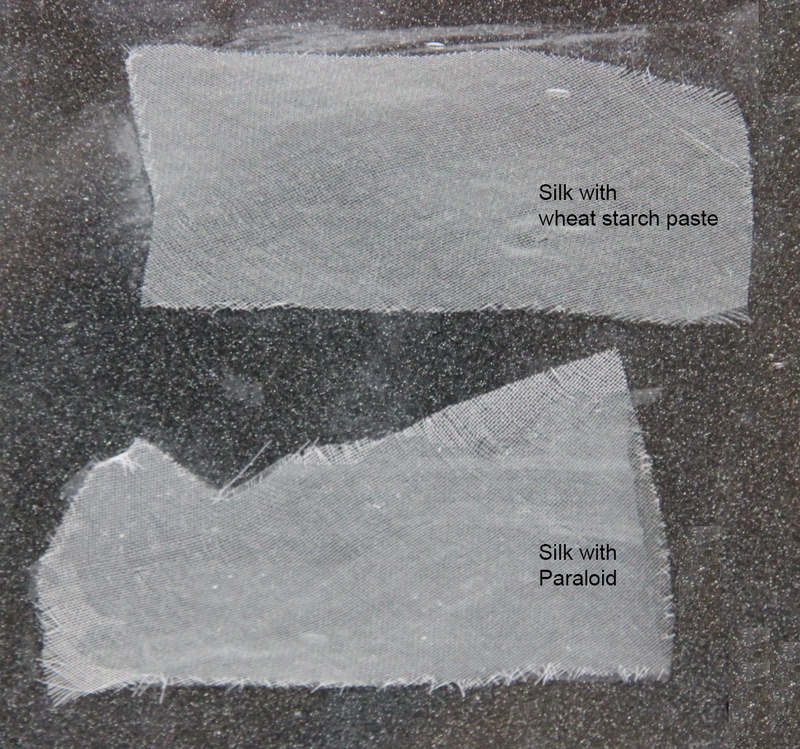 The white polyester was placed in a vat of dye and heated to around boiling point in order for it to absorb the colour. Due to the large quantities of boiling water involved and the fumes released by the dyes there were health and safety implications. Because of this I used fume extraction and wore protective equipment: heat and water proof gloves, water resistant apron and visor. It was not always possible to get an exact colour match to the glass, as some dyes absorbed into the fabric more than others. Reds were particularly hard to achieve as the red dye appeared pink when dried. I decided to aim for a colour that was lighter but closer in hue to the colour of the glass. I deliberately did not want the colour to be too strong in case it affected the tone of the glass. As you can see below, the colour of the dye mixture didn’t always look too promising, but it managed to create some successful results! 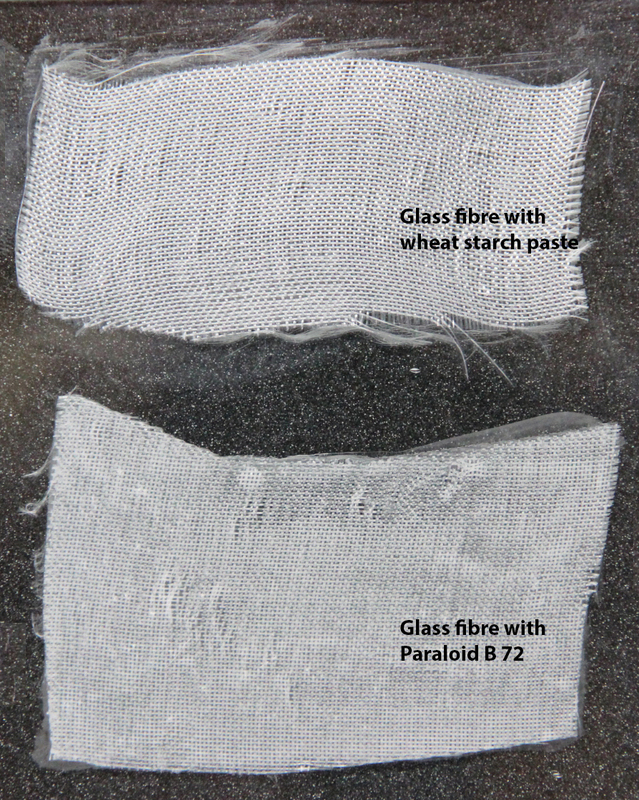 Several pieces of glass of different colours containing fractures were selected for repair using the dyed polyester, of which a couple are shown below. 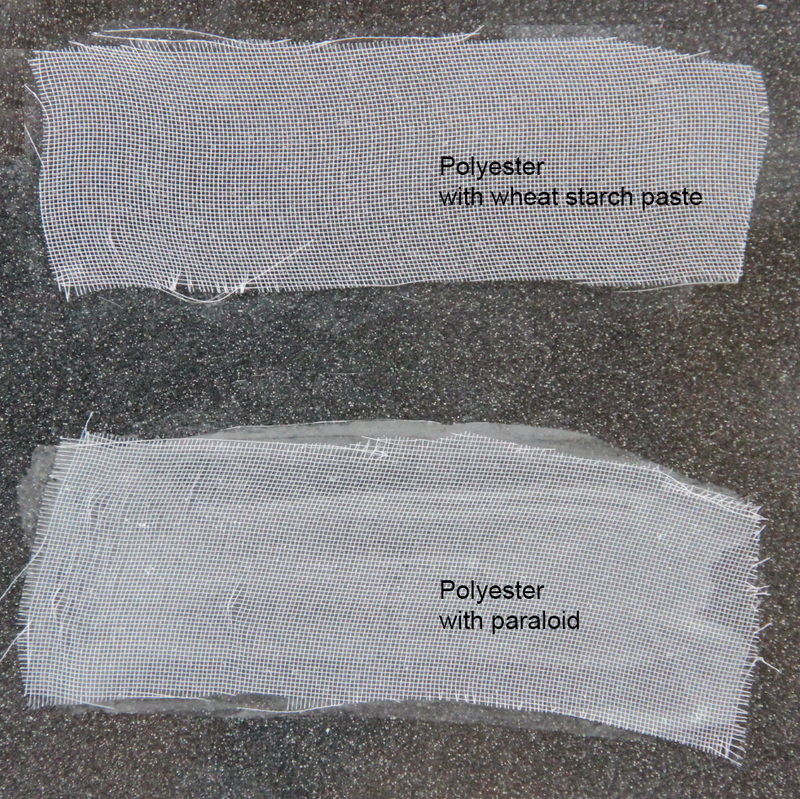 The chosen colour of polyester was cut to shape and applied with wheat starch paste to the back of the fractures. 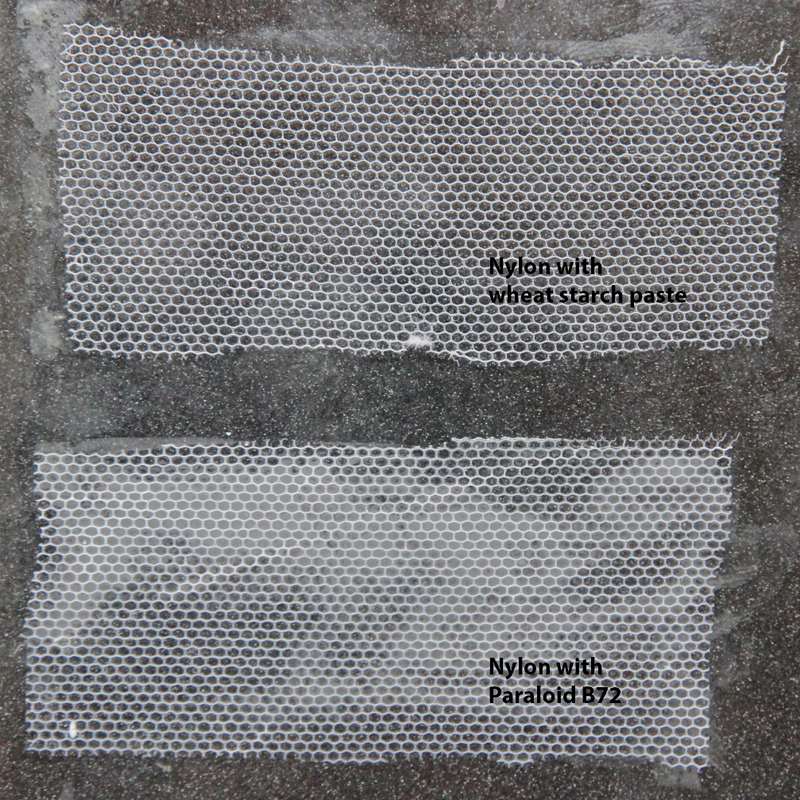 The repair provides good structural support and the polyester is remarkably invisible when viewed in transmitted light. When seen from the back of the panel it is still clearly discernable but blends in far more sympathetically than the un-dyed polyester. The colour of the polyester is sufficiently light that it does not alter the colour of the glass, yet it is enough to disguise the chink of light that had previously been visible through the fracture. 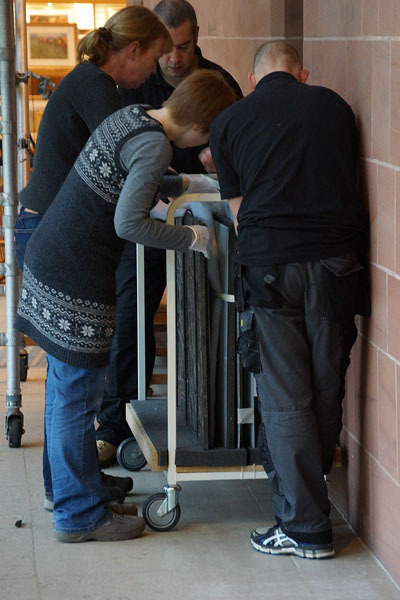 Satisfied that this technique provides maximum support to the fracture with minimal intervention to the panel, and is durable yet easily reversed, we have now trialled this technique on several panels which we will continue to monitor regularly to assess its behaviour over the long term. 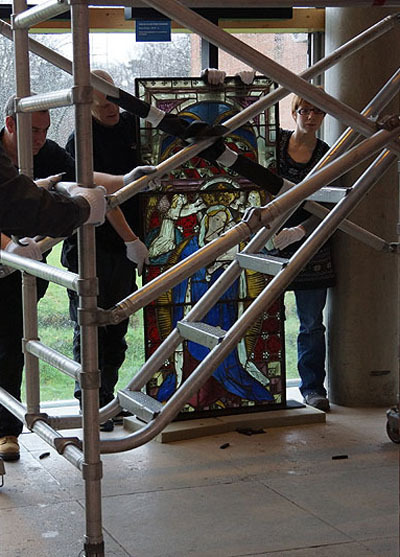 We have started conserving the Boppard stained glass. Our first task is surface cleaning which is not straightforward because there are so many different layers of dirt, original paint and retouching. 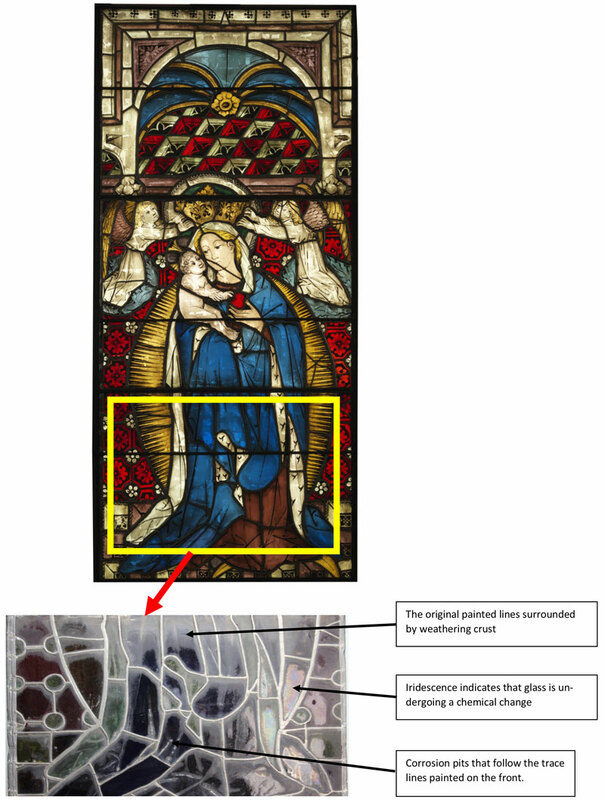 It is not that easy to tell what is there by intention (original or restoration) and what has simply accumulated on the surface of the glass over time. 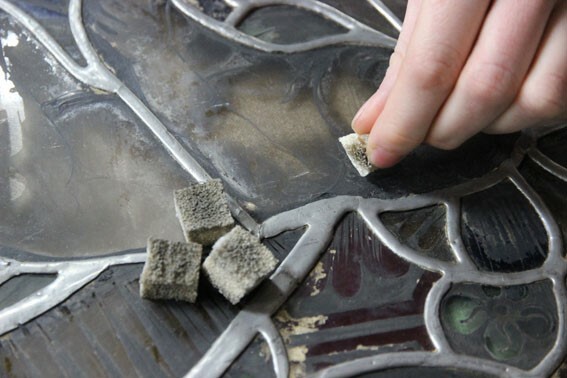 The glass is covered with a layer of loose dirt which can easily be removed using a smoke sponge. With a gentle dabbing motion the cells in the sponge pick up and trap dirt from the surface of the glass. This can be a very effective method of cleaning, especially if one is trying to clean loose particle dirt. The Boppard glass also has a layer of black sooty dirt. In order to remove this, we tested a variety of solvents and found that saliva is the most effective. We don’t much fancy cleaning 34 m² of glass using spit, so we are also using water (de-ionised) with a conservation grade detergent (Synperonic A7) and this works almost as well. 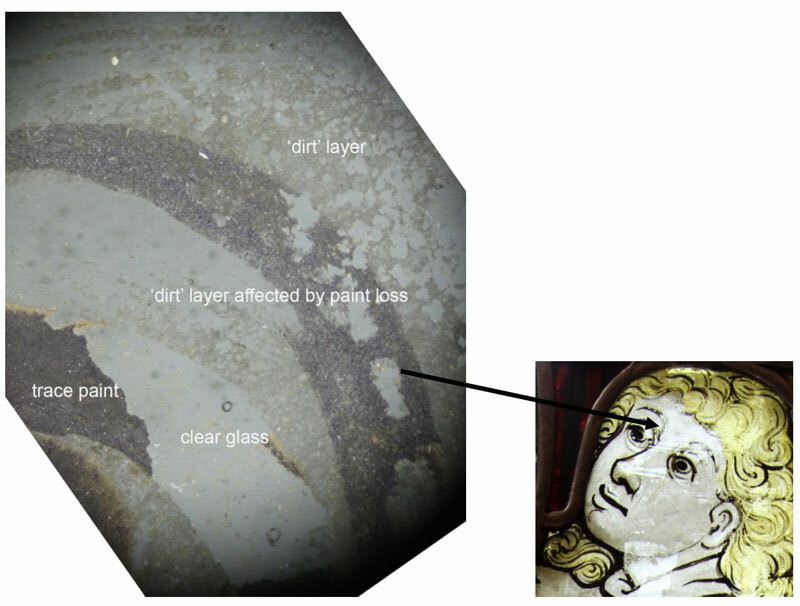 Apart from surface dirt there are other layers: In the 10 commandments window many of the glasses have a matt brownish- grey coating. We have considered if this could be a painted layer that was applied in order to tone down the colour and shine of the glass but we don’t think it is. 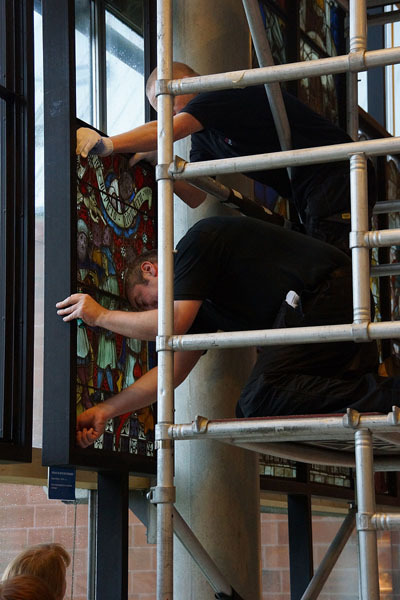 There are no brush marks to be seen and it coats the glass surfaces very evenly without any emphasis on the drawing. It cannot be fired paint because in some areas it has been completely removed. The layer is relatively hard and almost like a crust. It can be removed with mechanical means (scalpel) but not with solvents. 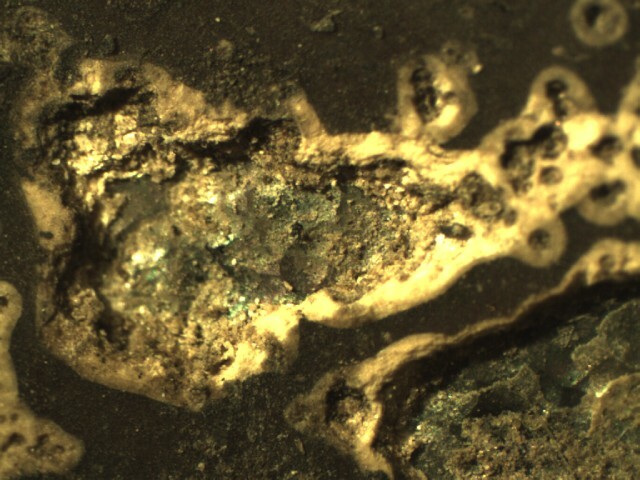 Seen under the microscope it sits on top of the trace lines. Where the layer is absent the glass looks remarkably transparent and unblemished. We think that this layer accumulated on the glass when dust, moisture and time worked together and formed a crust on the surface. In some places this crust has been removed by accident (pulling off sticky tapes, selective cleaning). The microscopic image shows how vulnerable all these layers are and how little else is there. If you removed any of it, you would be left with very little definition apart from the trace lines. This leads us to conclude that there was a problem with the original paint perhaps it was under-fired and not very stable. However it is astonishing (and slightly baffling) that the glass is generally so clear and un-corroded where the paint has flaked away. One explanation may be that the windows were removed from the church before the onset of serious industrial pollution. On the back of the same window we also find a similar pattern of painted areas and accumulation of dirt and weathering. 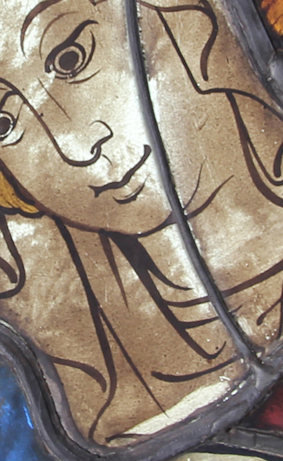 The glass was originally back-painted in order to emphasise the detailed drawing on the front. Again in most areas the original paint lines appear ‘faded’. Along some of these lines as well as around the edges of each glass and along the top of the panel (underneath the tie bar) moisture accumulated and in combination with dust started to form a crust on the glass surface. In the middle of each glass piece this crust is not present and the glass is in good condition. However one can see some iridescence which indicates that a chemical change has occurred. Most of these layers on the glass, both front and back will not be removed during conservation treatment. They are inorganic and very hard and although the glass underneath appears to have little corrosion it can easily be scratched and the gel layer can be damaged. The areas where the weathering layer and paint have been removed will be carefully retouched and we hope that by a combination of cleaning and retouching the overall impact of the imagery will be much improved. 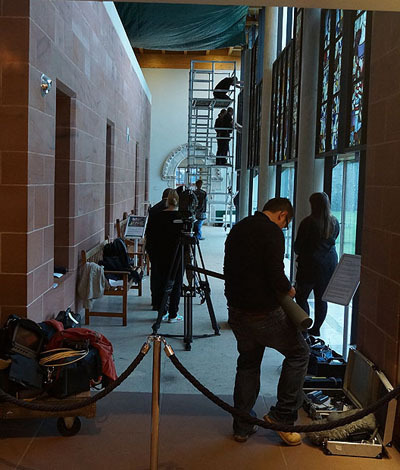 The Boppard stained glass panels have now all been photographed and every square centimetre of the 35 leaded and painted panels have been scrutinised from the front and back. 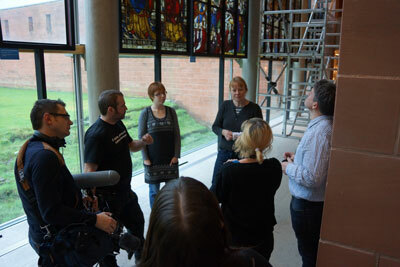 We have assessed the structure of each panel, looked at the condition of the glass, paints and lead and even the frames. 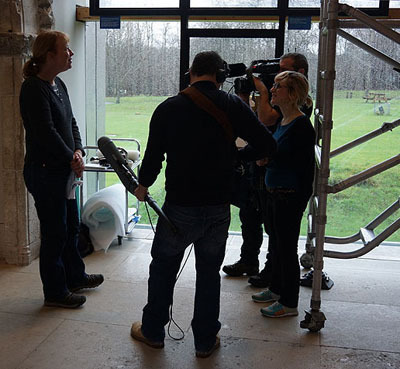 We have recorded the details of any restorations and tried to work out when they were added. Most of the panels are structurally very vulnerable. The lead used in the restoration of 1871 was very thin with not much body (less material = less cost) and as a result it is not very rigid or strong. It also does not provide any space for putty to be inserted so there is a lot of lateral movement in the panels especially when they are removed from their frames. 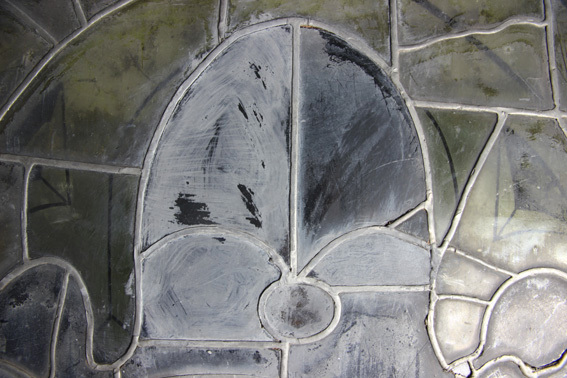 The original design incorporated few leads and large glass pieces and subsequently there has been damage to the glass and repair leads have been added, as in the image above. 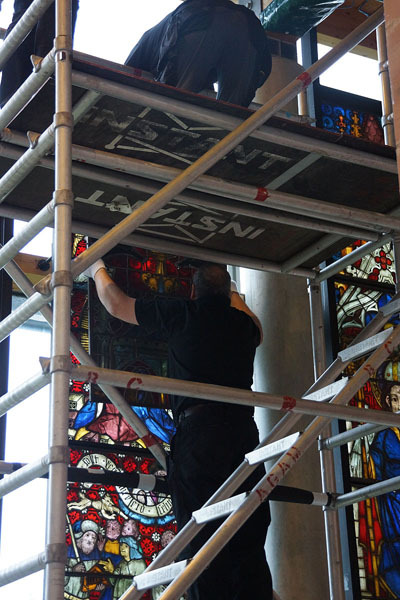 In other places broken or missing glass has been replaced by a restoration. The face above was probably inserted as part of the restoration carried out in 1871. But later someone must have thought that it was too pale and added a brown wash to tone the glass down. The problem with the wash is that it has not been fired, so it is very unstable and can easily be removed – as has already happened! In other areas where restoration glass was inserted, an unfired “wash” was applied from the back to help disguise the restoration. What is puzzling though is why this wash was applied to the lead as well. 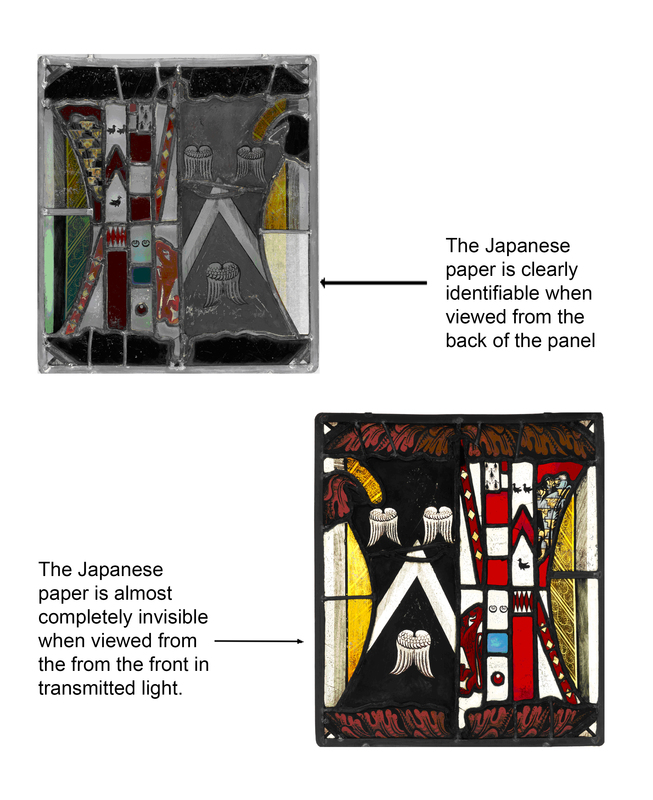 These sorts of findings raise the question whether the panels underwent significant restoration while they were in the Hearst and or Goelet Collections. It will be interesting to trace down some of the firms that carried out the work. 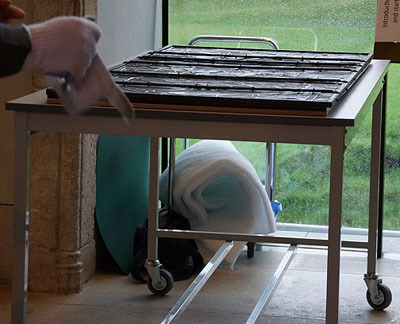 Some preliminary cleaning tests have been carried out as all of the panels are very dirty. 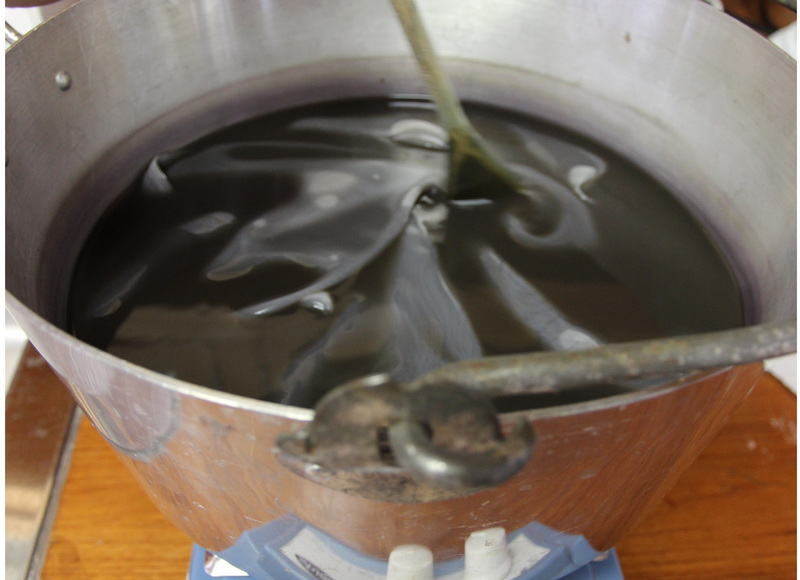 The cotton swab in the picture above was moistened with water and synperonic A7 (a mild detergent) and even after several applications the swabs still turned black very quickly. We have looked at paints under magnification…. 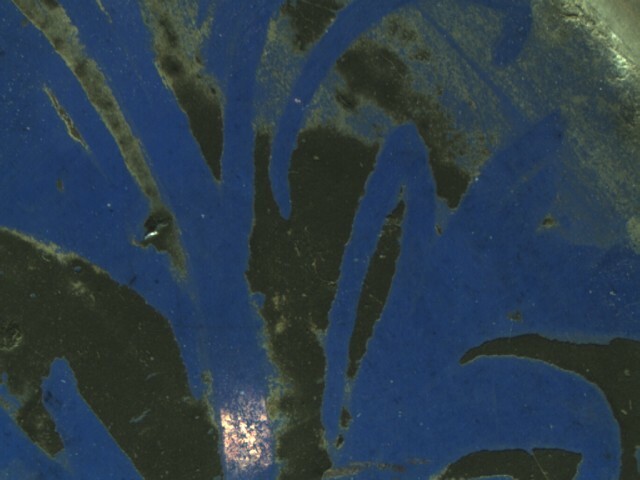 … and studied glass corrosion. On the whole the panels have been left in their frames for now. The only exceptions have been made where it is clear that a panel will have to come out of its frame anyway for treatment. The frames are interesting in themselves. In the case of the windows William Burrell bought from the Hearst Collection (Tree of Jesse Window and the Two Standing Saints) the frames seem to have been added by Wilfred Drake in 1938, whereas the frames for the window bought from Goelet (Ten Commandments Window) the frames probably predate the sale of the window in 1939. We are definitively going to keep them for now and if possible we will try to reuse them. Over the next 2 months the hundreds of photographs will be organised and filed and research questions will be summarised. At the moment it seems like there are more questions than answers! 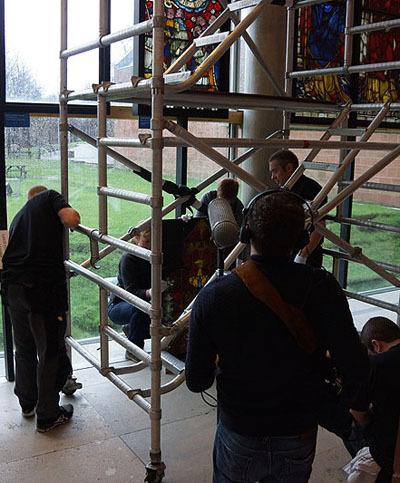 First Panel safely down and recorded on camera – no pressure then! Phew – The panel has landed! Megan protects the panel – nothing escapes the camera! 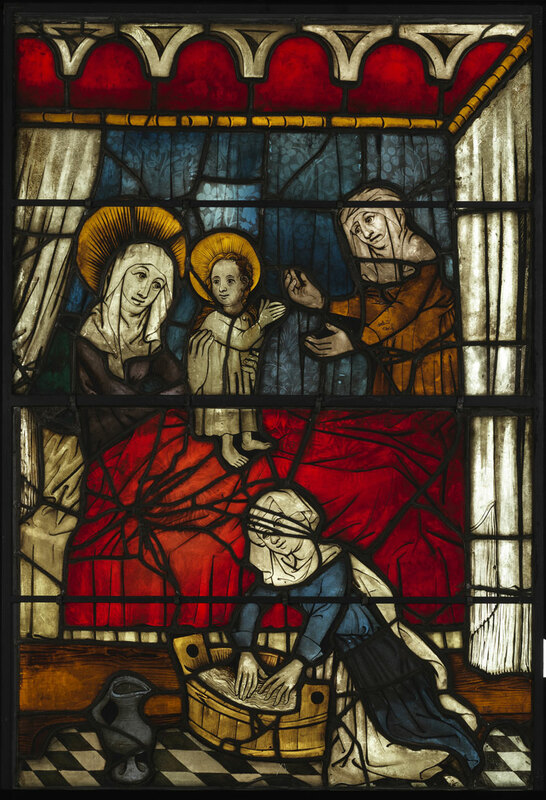 The two stained glass panels that make up this image depict the birth of the Virgin. It is an intimate scene, showing the infant Mary at the centre standing on her mother’s bed – she is clearly a well developed child so soon after her birth! Saint Anne (also Anna or Hannah), her mother, is sitting up in the splendid curtained bed which is covered by a vibrant red blanket. An elderly woman reaches out to take the child; this may be a servant or perhaps the grandmother. In the foreground is another woman washing white cloths. She is referred to in the catalogue as a midwife¹. Every time I look at this window I am distracted by the many repair leads; there are about 83 of them and they have been added over the years to secure and disguise glass that was broken. 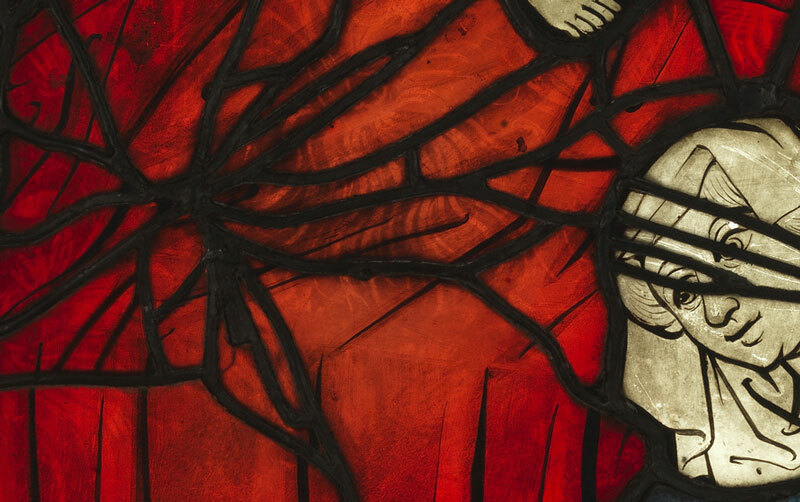 The area worst affected is in the beautiful red blanket and the face of the midwife, where the repair leads are so dense that they disguise the details of the paintwork and the intricacy of the design. The damage in this area of the window was most likely caused by the impact of a thrown stone (or a similar object) as the breaks in the glass radiate from a central point. The only way that restorers in the past were able to repair such damage was to insert lead cames to bring the broken glass pieces back together. They used H-section leads with 1-2 mm cores and to accommodate the lead without making the whole area bigger the restorer had to take a little bit away from each glass piece (the equivalent of the added core). 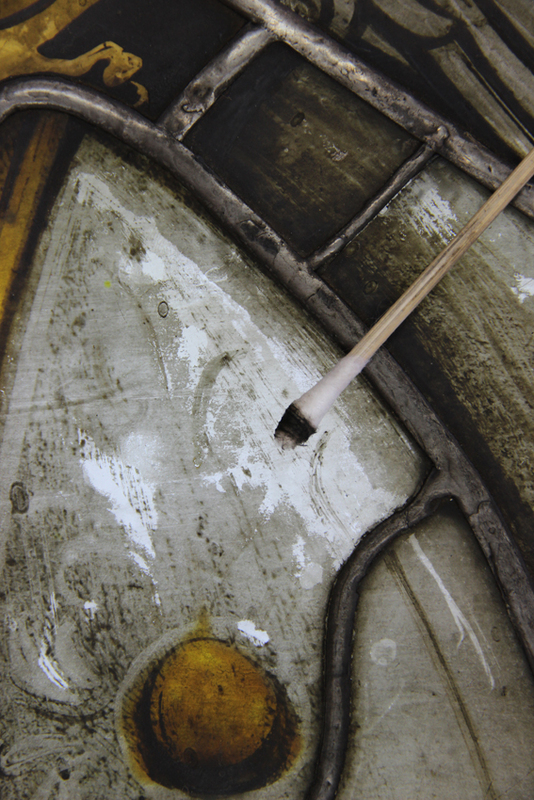 Today we have sophisticated adhesives that can be used to bond broken glass pieces. There are many different types and some are formulated to match the properties of glass very closely. 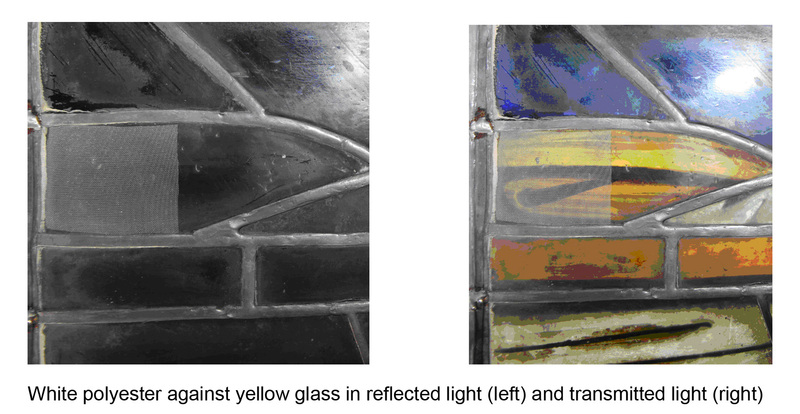 They can be tinted with pigments to match the colour of the glass and a skilled conservator can achieve an almost invisible repair. 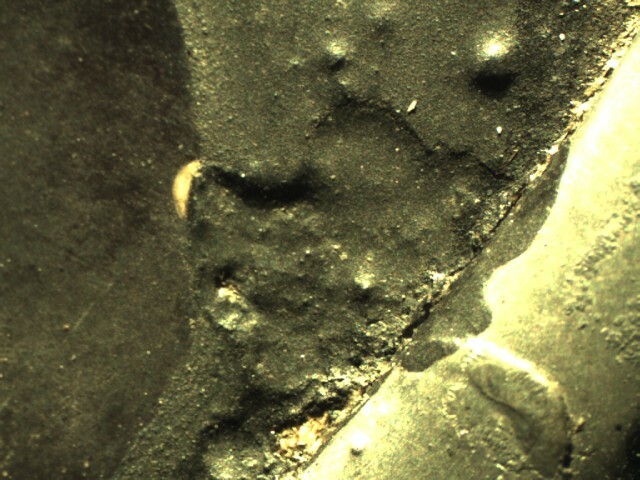 So in order to restore the area above, a conservator will carefully remove all the repair leads (which will be kept as samples and for analysis). 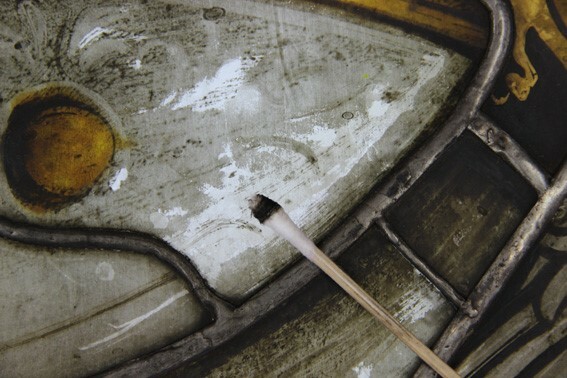 A tinted resin is then injected into the spaces left by the lead. Once it is cured, the glass piece appears intact again. It is a very time consuming process and it can be complicated – especially when dealing with such a complex break as in this window – but the outcome can be very successful and it can help to restore the image. Before embarking on the mission to improve the visual impact of the panel and to make it easier to read, there are some issues that should be considered. What are we aiming to preserve? Are we mainly concerned about the image and the painted details or are we also interested in using the object to tell stories about our history? 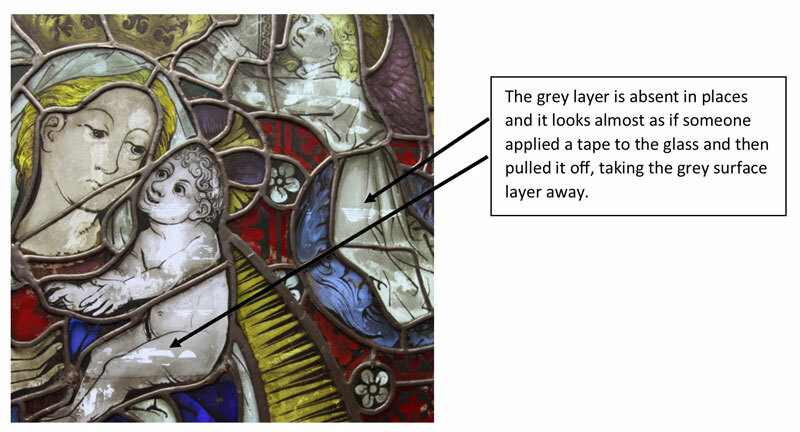 For instance, the complex lead repair is possibly the result of an attack on religious imagery during the reformation and witness to why so much of our stained glass heritage was destroyed and lost during that period. Is it worth preserving that aspect to better illustrate our history? As an object and piece of our heritage this window is as authentic as it will ever be and all marks on it including the repair leads and even the dirt are witness of its history. No amount of restoration will ever bring it closer to that state of authenticity. 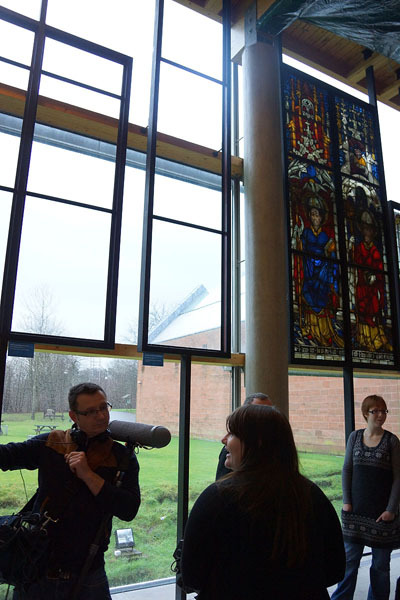 In this context it should also be noted that the window has been restored many times in the past and we cannot hope to ever return it fully to its “former glory”. 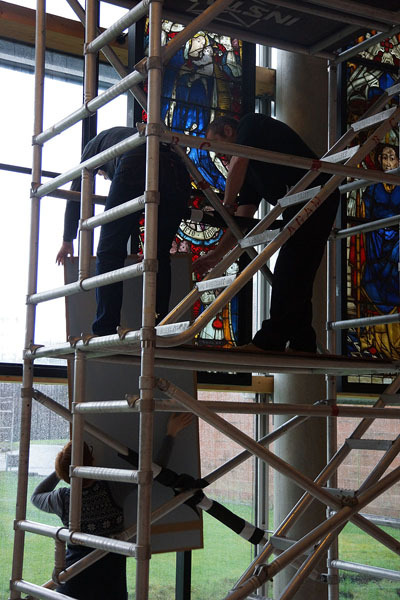 The lead repairs that are currently holding the glass together have probably been there for 142 years and they will last for at least that much time again provided the stained glass window is well cared for, kept in a stable environment and handled and moved as little as possible. A repair using an epoxy resin is said to last for as much as 80+ years but as this kind of product has only been in use since the 1970’s no one can actually confirm that. We have examples of epoxy repairs that were carried out 35 years ago and some of them are definitively failing. So we will also have to consider the cost implications of having to renew all these repairs in the future. 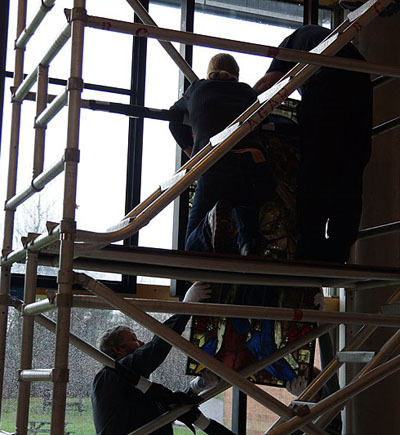 The stained and leaded panels from the “Life of Christ and the Virgin” window have now been assessed in the studio. We have taken images from the front and back in transmitted and in reflected light which records the maximum amount of information about the condition of each panel. One of the most immediately obvious things about the panels from this window is that all the lead has been tinned. 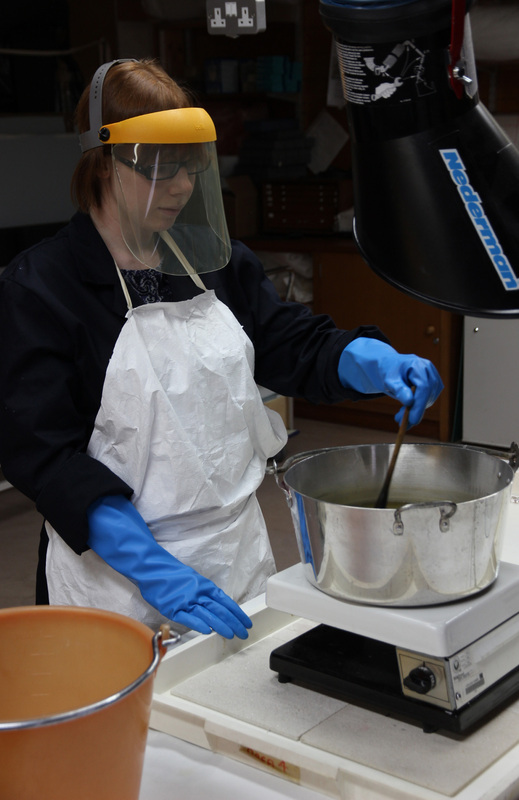 This means that molten tin has been applied and is covering the surface of the lead cames. Why would this have been done? Tin is harder than lead, so usually tin is applied to lead that is too soft and flexible – and therefore not giving enough rigidity to the panel. 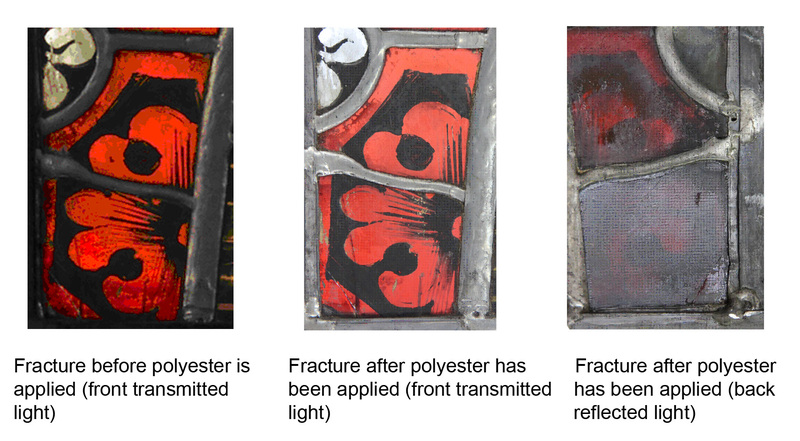 Could it have been applied in 1881 when the panels were restored in Berlin in the Royal Institute of Glass Painting? I think this is very unlikely. It looks like the panels were completely re-leaded during this restoration and I would be surprised if the restorers would have tinned a newly leaded panel. It is more likely that the new lead was very pure – and therefore very soft. It was also probably very insubstantial with thin cores and flat flanges. So I assume that sometime perhaps 40 or 50 years later, they were tinned to make them stronger and more rigid. It is possible that the tinning of the lead was carried out while the panels were in the United States in the collection of the newspaper magnate William Randolph Hearst. Tinning copper foil to make stained glass windows and other decorative artefacts such as Tiffany Lamps was an invention made in the USA in the late 19th century. 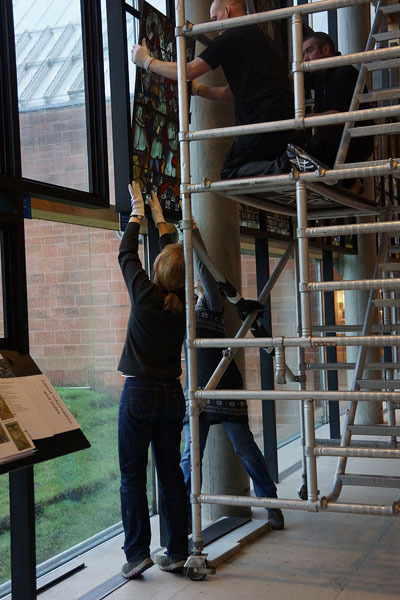 Stained glass restorers there would have been familiar with tinning as a technique to be used to strengthen a panel. In the coming months I will explore this issue as I progress with further assessments. The most obvious investigation will be to find an area of accessible lead where I can take a sample to analyse and find out if my theories are substantiated by what I find.